Designed for use on minor wounds and injuries within the workplace, add the Steri-Strip to your First Aid Box. Each one has been manufactured from a non-woven and porous backing material that has been coated with a pressure sensitive backing material. They have a thin and durable construction that can be used to close up small wounds without the need for invasive stitches. 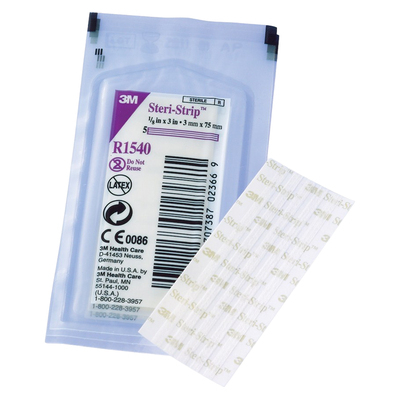 For application purposes, each steri-strip should be applied in a manner that pulls the skin on either side of the wound together without causing further injury to the patient. Here at Gompels, we have a wide range of First Aid resources from our Adhesive Sterile Dressing Pad through to our Low Adherent Dressing Pads at exceptional wholesale prices.